Regular Meetings, unless otherwise noted, are held the 4th Monday of every month at 7 pm in the Community Room at St. Mary’s Woods, 1257 Marywood Ln., Richmond VA, 23229. Contact us at info@richmondbonsaisociety.org Visit us at www.richmondbonsaisociety.org or on Facebook. Annual RBS Picnic and Auction –May 22, 2-5 p.m.
RBS invites everyone to annual our picnic and auction. RBS will supply the main dish, ice, drinks, paper goods, and utensils. Members should bring a side dish or dessert. Auction items should arrive from 2-3 pm, we’ll eat at 3 pm, and the auction will begin about 3:30. A minimum 20% from each sale is donated automatically to the club, but members keep the rest for themselves. Typically, members bring 3-5 items to sell. If you have more than that, they should be grouped into lots. You must be a RBS or PBA member to sell or bid on items at the auction (but you can join that day). The picnic and auction will be held at Joseph Bryan Park. The park entrance is on Hermitage Road, which is just north of the I-95 interchange. Watch for RBS signs marking the path to the #1 shelter. 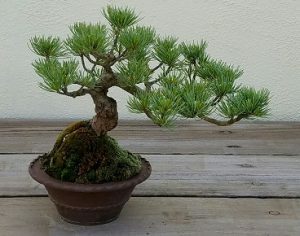 This event is a great way to find bonsai plants, pots, tools, and other supplies for a great price. In addition, we will be electing officers for 2016-18 at the picnic. The optimist in me keeps saying “my maples are loving this weather”. It’s true that the past few weeks have been dark, wet, and cool, but my trees and I will take this any day over a heat wave. 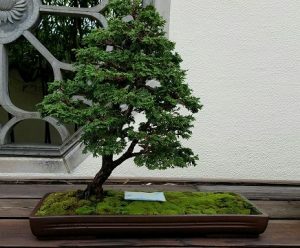 One particular fast moving storm on Saturday made World Bonsai Day Festival a little interesting for a bit. I admit to clutching tent poles at least twice. That being said, the festival was a great success, with vendors, demos, lectures, workshops, and the PBA Member tree show. I want to take a moment to personally thank RBS members Dennis and Chris who contributed most of their weekend to the festival. While it may be a trek to DC, it is certainly worth the trip. I think that it is unfortunate that so few RBS members took advantage of the opportunity. As spring nears its end, I reflect on the many RBS activities we’ve had. We have been busier than ever before with at least 3 major activities each month, and more planned. Some of these were well received while others were missed opportunities for our members. In particularly, the Saturday study groups/ work days. We hear that they are great success and an integral part of other clubs, and there were RBS members who insisted that we too needed them. The RBS Board decided to try them for a few months on a trial basis. Members that attended the March, April, and May dates usually had a good time and learned from each other, but participation has been very low. We will schedule a few more, but I hope that they catch on soon or the board will need to reexamine our commitment to them. As for the other activities, we’ve had four very exciting workshops with outside guest teachers that have all been very good, with several more on the schedule. It’s always nice to learn from and work with Roy. He has such vision and direction. And of course, we appreciate Joe Gutierrez’s assistance with the workshop. Robert Mahler held a BYOT workshop in the afternoon and a shohin workshop in the afternoon. It is always a pleasure to work with Robert and we hope to work with him again next year. 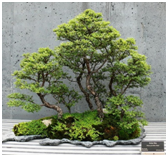 RBS members gathered at Gardener’s Nursery and explored it for possible bonsai stock. We found good junipers, maples, river birtch, and azaleas. Then members returned to St. Mary’s Woods to work on trees. 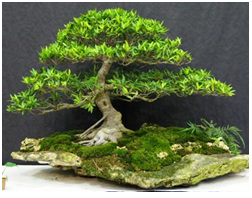 Jan wired and pruned a number of trees and Thomas cleaned and prepared trees for the PBA Member Bonsai Show. Working together is always fun and informative. Annual RBS Picnic and Auction –May 22, 2-5 p.m. RBS invites everyone to annual our picnic and auction. RBS will supply the main dish, ice, drinks, paper goods, and utensils. Members should bring a side dish or dessert. Auction items should arrive from 2-3 pm, we’ll eat at 3 pm, and the auction will begin about 3:30. A minimum 20% from each sale is donated automatically to the club. Typically, members bring 3-5 items to sell. If you have more than that, they should be grouped into lots. You must be a RBS or PBA member to sell or bid on items at the auction (but you can join that day). The picnic and auction will be held at Joseph Bryan Park. The park entrance is on Hermitage Road, which is just north of the I-95 interchange. Watch for RBS signs marking the path to the #1 shelter. May meeting Due to our Annual Picnic and Auction on May 22, we will NOT have our regular meeting on Monday, May 22. See you in June. RBS members are invited to bring their own trees to work on together in our normal location at St. Mary’s Woods. The point of a study group is that you can solicit advice and guidance from other members, or just come watch and learn. The long day gives you plenty of time to start and complete projects. Members should bring tools, drop cloths, refuse containers, and cleaning supplies as needed for themselves. Azalea workshop with Joe Gutierrez June 25, 10am-4pm at St. Mary’s Woods. Joe Gutierrez from NVBS, who is well known for his skills with azaleas, will lead a BRING YOUR OWN TREE workshop specifically for azaleas. This workshop is FREE for RBS/PBA members. If you do not have an azalea or two to work on, I would advise that you start looking for some at local nurseries or maybe rescue from landscapes. There is some good stock at where we had our nursery crawl, Gardener’s Nursery in Short Pump, but they can also be found elsewhere. Miniature landscapes are among the oldest arts in China and Japan. 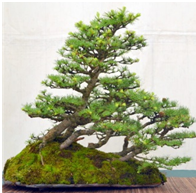 Referred to in Chinese as “penjing” and Japanese as “bonkei” or “saikei”, they are compositions that include rocks, tree’s, water and other natural elements, normally placed on a slab, rock, or shallow container. It may include a tree but not essential. 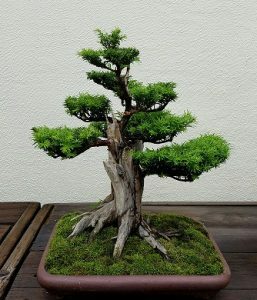 While some bonsai may be accompanied by some landscape scene or accent plants, the main focus is on the tree. In landscape planting, the focus moves from the tree to the overall affect of the scene, indeed sometimes completely eliminating the tree. Landscapes can be panoramic-type landscapes utilizing very small plants to have a vast scale or large horizontal cliff stones with small and medium size trees. A landscape planting will remind the viewer of a natural location through its topography, materials, and plantings. 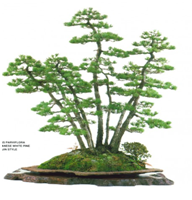 The aesthetic impact results not from individual trees, but from the builder’s general design, the cumulative visual impact of several or many live trees, the rocks and soil of the landscape, and the variety of other plant forms placed in the display. The shape and structure of the ground is very important and should not be neglected. The usual principals of proportion, presence, and placement are vital. Saikei allows multiple species of tree to be placed in a single landscape, and allows multiple plant forms like flowers and grasses. 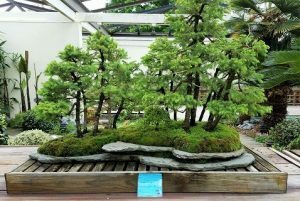 In bonsai, trees completely dominate the group planting, while in landscapes, they decorate and are arranged to emphasize perspective. 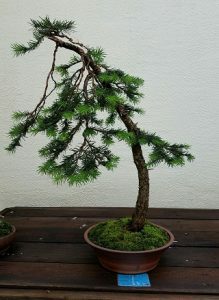 The trees themselves are similar to bonsai, but much less elaborate and have less age and individual characteristic. Trees can appear singly or in groups at any suitable spot in the landscape, even on the sides and tops of rocks representing mountains or hills. Accent plants or ground cover may be added to help evoke the landscape. Other rules that some follow include the mandatory use of stones, white sand is used to represent water, maintain a balance on negative space, and the placement of trees and roots above the rim of the tray. While Chinese pinjing allows, even encourages the use of miniature figurines or structures, Japanese saikei philosophy discourages “decorations”. Landscapes with a variety of plants can be designed to show the progress of the seasons. As in all art we need to remember less is more and know when to finish. Donate a Book or Magazine: RBS maintains a lending library available to members. The lending selection includes many magazines, books, and some videos. If you have books or magazines that you no longer enjoy, please donate them to the club. See Jonas at our next meeting. PBA mailing list – PBA is compiling an email list to make communications more streamlined. Sign up here. Mixed Bonsai Soil -regular and shohin soil (fine) 5 gal bags. Call Lee (320-1257) to place a special order. Notice: RBS mails printed newsletters upon request. We encourage members to update their member records and switch to electronic versions of the newsletter when possible. If you receive a printed version, but would prefer electronic, please inform the club secretary or reply to this mailing.